(a) In vitro kinase reactions were performed by using GSTp531-64 (FP267) as substrate and GST-CK1δ (FP449) as enzyme, or using (b) GST-CK1δ375–428 (FP1183) as substrate and recombinant PKCα as enzyme in combination with one of three PKC-specific inhibitors (Go-6983, enzastaurin, and bisindolylmaleimide I (BIM I), respectively). Data are presented as normalized bar graph. Amino Acids, 2016, 48(5):1185-97. Go 6983 purchased from Selleck. MC3T3-E1 cells were transfected with pcDNA3-CFP-CITED1 and cultured for 48 h. Thereafter, cells were cultured in α-MEM with 1% FBS for 12 h; the medium was then replaced with Hank's solution+α-MEM (ratio=8:2) and cultured for another 20 min. 1 μM Go6983 or vehicle were cultured for 1 h before 100 nM hPTH treatment. 10 μM Phorbol ester (TPA) was applied to the cells for 30 min. 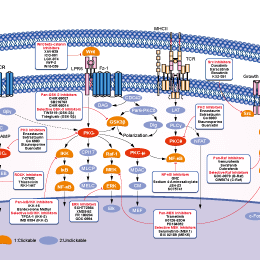 Cellular Signalling, 2014, 26(11): 2436-2445. Go 6983 purchased from Selleck. Immunoblot analysis and quantitative analysis of pPKC, Claudin-1, ZEB1, ZO-1, Slug, Twist, MMP9 after treatment with 1μM Go 6983 in 231 HM STC2i cells at different time point. PLoS One, 2015, 10(4): e0122179 . Go 6983 purchased from Selleck. Gschwendt M, et al. FEBS Lett, 1996, 392(2), 77-80. Peterman EE, et al. J Cardiovasc Pharmacol, 2004, 43(5), 645-656. Young LH, et al. Cardiovasc Drug Rev, 2005, 23(3), 255-272. Andresen BT, et al. Hypertension, 2001, 37(2 Part 2), 635-639. Kumar A, et al. J Biol Chem, 2004, 279(23), 24255-24264. Kim HR, et al. 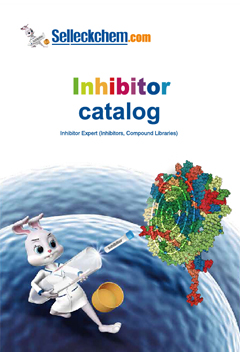 Cancer Immunol Immunother. 2009, 58(10), 1691-1700. 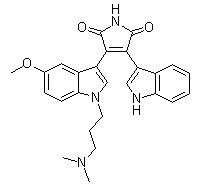 Sotrastaurin : Potent and selective pan-PKC inhibitor, mostly for PKCθ with Ki of 0.22 nM; inactive to PKCζ. Phase 1/2. Features:Unlike former PKC inhibitors, Sotrastaurin does not enhance apoptosis of murine T-cell blasts in a model of activation-induced cell death.